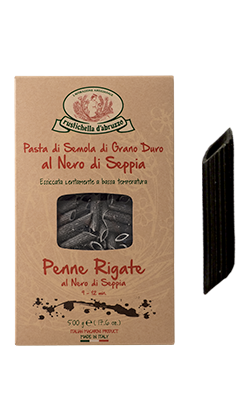 During the pasta production, Rustichella d’Abruzzo thought about adding natural ingredients to the dough of durum wheat semolina and water, such as Red Chili Pepper, natural Squid Ink and the best Spinach leaves coming exclusively from Italy. We then created Tonnarelli, Penne Rigate and Linguine, aromatized types of pasta with no colourants or preservatives which can be served even with just a bit of raw Extra Virgin Olive Oil, or tried with other Rustichella d’Abruzzo red and white condiments. Squid Ink artisan pasta, similar to Spaghetti but with a bigger diameter. It matches seafood-based condiments with cherry tomatoes and rocket and the “mari e monti” (seas and mountains) version with prawns and cheek lard. It is perfect also with Rustichella d’Abruzzo organic “Pomodoro e Basilico” sauce or “alle Olive” sauce with a bit of Rustichella Extra Virgin Olive Oil. Cooking time: 9-11 minutes. 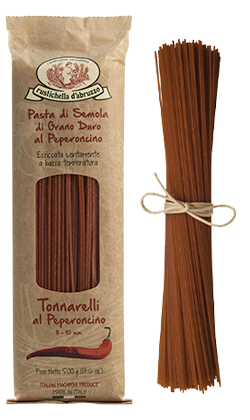 Chili Pepper artisan pasta, similar to Spaghetti but with a bigger diameter. 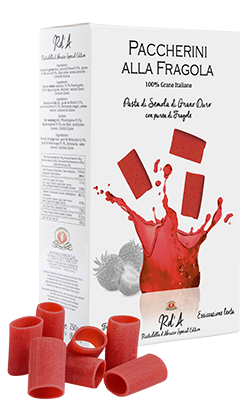 It indisputably matches Rustichella d’Abruzzo “alla Arrabbiata” or “Amatriciana” sauces, for the lovers of intense tastes. You can also season it with a bit of Rustichella INTOSSO Extra Virgin Olive Oil or a condiment made of Rustichella d’Abruzzo Anchovies and Chili Pepper in Extra Virgin Olive Oil, for those who cannot resist chili pepper. Cooking time: 8-10 minutes. 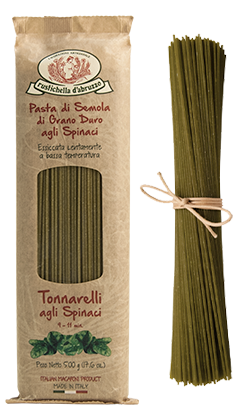 Artisan pasta aromatized with Spinach leaves from Italian cultivations, similar to Spaghetti but with a bigger diameter. 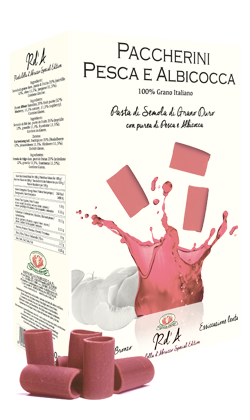 It matches Rustichella d’Abruzzo organic “Pomodoro e Basilico” sauce or “alla Arrabbiata” sauce, or with Rustichella d’Abruzzo organic “Pesto alla Genovese”, not pasteurised. Cooking time: 9-11 minutes. 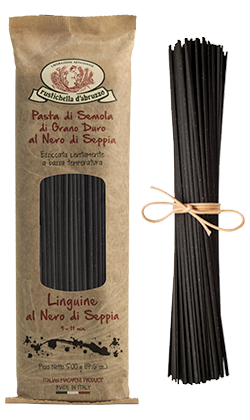 Rustichella d’Abruzzo long-shaped pasta aromatized with Black Squid Ink. The classic recipe is with squids, prawns, cherry tomatoes and mullet’s eggs, or with smoked salmon and Rustichella d’Abruzzo Extra Virgin Olive Oil. We recommend it with Rustichella d’Abruzzo “Pomodoro e Basilico” sauce. Cooking time: 9-11 minutes. 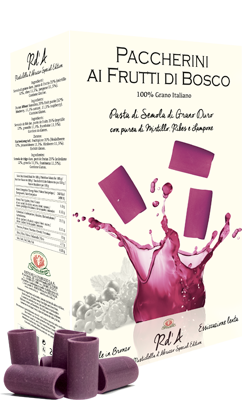 One of Rustichella d’Abruzzo new items that have recently been introduced in Italy and abroad. 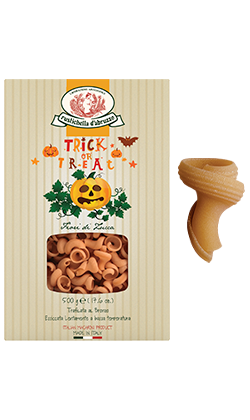 This type of pasta is similar to Torchietti and is made with 30% of puree of pumpkin. You absolutely need to try it with Rustichella truffle-aromatized Extra Virgin Olive Oil. Cooking time: 10-12 minutes. 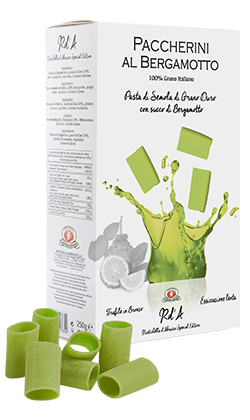 One of Rustichella d’Abruzzo new items in Limited Edition that have recently been introduced in Italy and abroad. 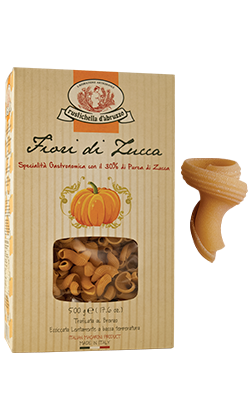 This type of pasta is similar to Torchietti and is made with 30% of puree of pumpkin. You absolutely need to try it with Rustichella truffle-aromatized Extra Virgin Olive Oil. Cooking time: 10-12 minutes. 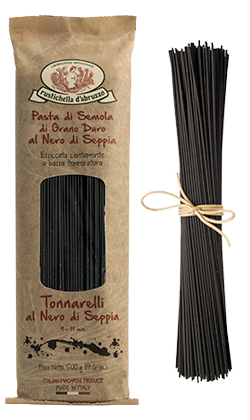 Rustichella d’Abruzzo short pasta aromatized with Black Squid Ink. The classic recipe is with salted codfish, cherry tomatoes, mullet’s eggs and Rustichella d’Abruzzo Extra Virgin Olive Oil. We recommend it also with Rustichella d’Abruzzo “alla Pescatora”, “alla Napoletana” and “alle Vongole” sauces. Cooking time: 9-12 minutes. 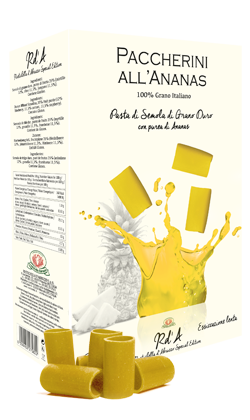 Rustichella d’Abruzzo has recently introduced an exclusive new item in its references, Paccherini ai Frutti di Bosco, a type of pasta made to satisfy the needs of Chefs to create innovative and unique recipes. 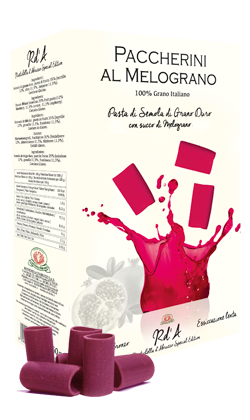 It is made with a mix of 100% Italian durum wheat semolina and 23% of fresh puree of wild fruits (Blackberry 12%, Currant 11,5% and Raspberry 11,5%). Paccherini is bronze drawn and slowly dried at low temperature in order to keep perfume and quality. Starred Chef William Zonfa’s recipe is Paccherini ai Frutti di Bosco with Porcini mushrooms, asparagus salad, L’Aquila saffron D.O.P. cream and juniper-flavoured ricotta cheese. For the lovers of seafood, we recommend it with roasted cuttlefish, parsley and Rustichella d’Abruzzo PrimoGrano INTOSSO Extra Virgin Olive Oil. Cooking time: 13-15 minutes. 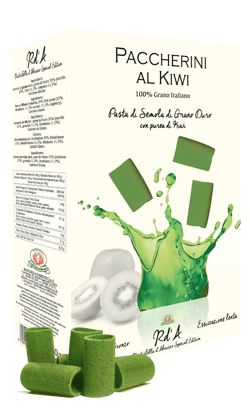 The history of kiwi began in China more than 700 years ago, where it was very well appreciated in Great Khan’s empire for its delicious taste and emerald-coloured pulp. It began to be widespread in the rest of the world in the 19th century, when a collector of the Royal British Society of Horticulture sent to his homeland some fruits and seeds. It was imported in Italy in the 70s, and nowadays it is the second world’s largest producer, thanks to its climate and the passion of its farmers. Cooking time: 13-15 minutes. Originally from Asia Minor (Persia and Afghanistan), pomegranate (Latin name “Punica granatum”) and its fruits were brought in Europe by Phoenician merchants. Italian word derives from “mela” (apple), for its shape and colour, and “grana” (grain), for the consistency of its internal seeds, very similar to corn. It is one of the main subjects in many stories and legends, and it was a sacred plant to Juno and Venus in ancient Greece. In ancient Rome, brides used to put pomegranate branches in their hair, symbol of fertility and richness. It was very widely represented in works of art and culture during the Renaissance, main subject in the works of Caravaggio. Nowadays, this fruit is used to make Italian and European dishes simply unique! Cooking time: 13-15 minutes. The Pineapple is originally from South America. Indios used to call it ANANA, from the word NANA (perfume), while Conquistadores used to call it PINE CONE OF THE INDIES or ROYAL PINE CONE. The pineapple is a symbol of welcome and hospitality and has a delicious sweetness on the inside. The amount of vitamins and natural constituents make the pineapple a healthy fruit. Cooking time: 13-15 minutes. Peach and Apricot are the summer fruits par excellence. Apparently, Chinese emperors used to consume them already 4000 years ago. Originally from Central Asia, these fruits were brought to the Mediterranean area after the conquests by Alexander the Great. In ancient Egypt, they were sacred fruits to Arpocrate, god of silence and childhood: in fact, children’s cheeks nowadays are usually compared to these fruits, for their velvety softness. After a period of oblivion, Arabs reintroduced their plantation, for gastronomy and pharmacological use. Many famous artists such as Caravaggio, Renoir, Arcimboldo and Monet often painted them in their works, thanks to their beauty and colour. Cooking time: 13-15 minutes. Thanks to its shape and colour, strawberry has always been considered the fruit of love. It was already known to the ancient Romans who consumed it during the festivities in honor of Adonis. According to the myth, the tears of the goddess Venus fallen on the earth after her death would have given rise to the seedlings of strawberries. With a sweet taste and an intense aroma, strawberries are a concentrate of beneficial and curative properties. Cooking time: 13-15 minutes. The origins of bergamot are uncertain and enveloped in an aura of mystery. Legend narrates that the plant was imported by Christopher Columbus from the Canary Islands, arriving in Reggio Calabria from the Spanish city of Berga from which it takes its name. The first plantation of bergamot dates back to1750 when the owner Nicola Parisi develops it along the coast of the rushes. Harmonious and pleasant its essence is used as an antidepressant and antioxidant. Cooking time: 13-15 minutes.